Combine one of Móz dynamic metal grains with your custom image to create a unique multi-layered surface. 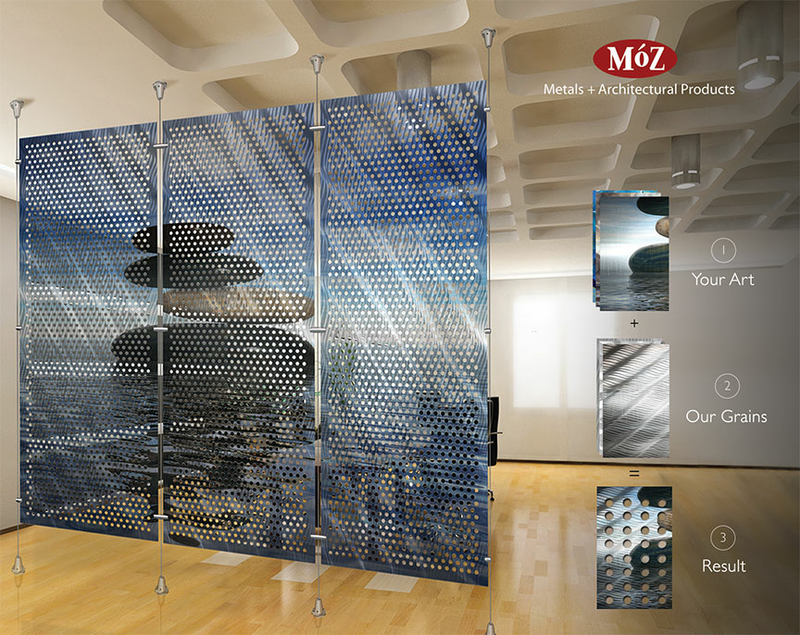 Digital images can be printed on solid or perforated aluminum sheets for a variety of applications including metal walls, columns, ceilings, room dividers, signage and art. Take digital technology to another level with images infused on Móz Designer Metals. Unique spaces just got more personal where your designs come alive. For more information on Custom Digital Imagery, please contact us. HighRes showcases premium quality imagery for panels in solid metal or perforated metal. Enjoy the power of custom imagery for your space with the performance capability of each material. HighRes is the best choice for large-scale installations as it offers precise panel-to-panel registration.